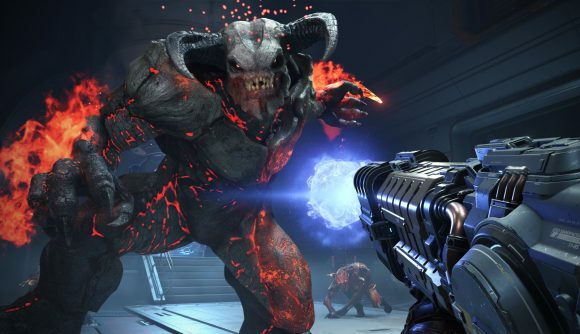 Bethesda has announced its E3 2019 press conference is set to take place on June 9, and will focus on Doom Eternal. Though a venue is yet to be confirmed, the publisher announced it will be holding its show at 17:30 Pacific in a recent blog post. The company has also stated it plans to invite more fans this year, to coincide with their showcase’s tagline “be together”. Doom Eternal was announced last year at E3 2018, and though not much else has been said on exactly what will be shown of the game, Bethesda has assured fans that we will get “an in-depth look” during the showcase – our first since the QuakeCon 2018 gameplay reveal. Bethesda do promise “plus much, much more” at E3. Fans of the publisher’s Rage series may be treated to some announcements surrounding updates to Rage 2, which is set to release just weeks before the showcase on May 14, as well as further news on the company’s plans for its other series such as Wolfenstein. This might come as a disappointment to some fans who are still awaiting the next iteration of The Elder Scrolls or Bethesda’s new IP Starfield, but as news is still thin on the ground, fans can still hope that they may make some form of appearance. After all, Bethesda does have a trend of pulling their E3 showcases off with some twists and turns, and I wouldn’t rule anything out quite yet. Bethesda’s showcase last year teased a fair few up and coming projects, including the anticipated but ultimately disappointing Fallout 76. It’s possible that it might announce further improvements for the game after the backlash it received.